Attention all road racing motorsports teams. I might just be your go to guy for amazing photographs of your motorcycle or sports car racing machine. It is called stock photography which essentially means I already have a library of images available for licensing or purchase. Why hire your own photographer to go out and capture your race vehicle at an event when I may already have the picture you need in my library. Take a look through my web site and you’ll get an idea of what is available from me. What you see here is just a fraction of the thousands of images I have available. Just this year I have attended two national events on the NHRA Mello Yello Drag Racing Series tour…the first being the New England Nationals in Epping, NH and the second being The Summernationals at Raceway Park in Englishtown, NJ. Did you race at either of these events? Chances are I already have some great pictures of your drag racing car. I also attended the CCS (Championship Cup Series) event at New Jersey Motorsports Park (NJMP) in July of 2017. I will be returning there for the upcoming Championship Cup Series event on Labor Day weekend and will be back trackside the following weekend for the MotoAmerica Championship of New Jersey presented by K & N Filters. If your bike is not in my stock library yet it probably will be by the end of these two events. Stay tuned to my web site and Facebook page for new additions. If you don’t see your ride pictured there drop me a line. Chances are I have some awesome pictures of it. 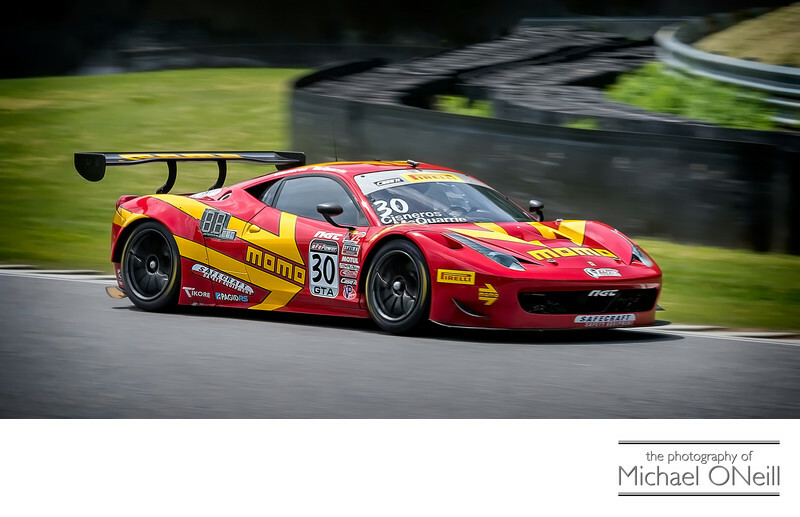 The beautiful red Momo Ferrari race car pictured here was photographed during The Pirelli World Challenge at Lime Rock Park over Memorial Day weekend of 2017. It is one of hundred’s of cars I photographed on track that weekend. I returned to Lime Rock in July of 2017 for the IMSA WeatherTech and Continental Tire Series events during the Northeast Grand Prix weekend. Again, hundreds of great photos of your amazing sports cars (Prototype, GTLM, GTD, ST, etc, etc) were captured in action and reside in my stock library. If you are a stock agency or a news service, and are looking for up-to-the-minute race coverage be advised that I update my web site, Facebook Page, Instagram and Pinterest with fresh images…usually within 24 to 48 hours after the checkered flag drops. Need those pictures sooner? I’m available for assignment anywhere and can provide images in near real time to meet any deadlines you may have in place. Hope to hear from you all.